Last week, I testified before the House Judiciary subcommittee on the Constitution and Civil Justice, on HR 490, also known as the Heartbeat Bill. The bill, introduced by Iowa Republican congressman Steve King, prohibits abortion of an unborn child once the child's heartbeat is detectable. I have been fighting for the last 30 years to protect the unborn, and I wholeheartedly gave my endorsement to this bill. In follow-up questioning, I responded to allegations, often made, that abortion is essentially a health and welfare program, categorizing it like major government spending programs that target the poor, such as Medicaid and food stamps. I shared my view that thinking about abortion in this way is "disingenuous." It represents the very sick view that killing children in the womb is a way to fight poverty. One member of the committee, Steve Cohen, a Democrat representing the 9th district of Tennessee, has a lifetime record, both in the U.S. congress and as a state legislator, advocating this distortion that somehow abortion is a remedial measure for low-income black women. Confused liberals like Cohen think the problem is pregnancy rather than sexual activity taking place outside of where it belongs — in marriage. So they encourage the very behavior that leads to poverty — promiscuity and abortion. We can see the results in Cohen's own district. According to the U.S. Census Bureau, in Cohen's 9th district in Tennessee, 8.7 percent of households headed by a married couple with children under 5 are poor. However, 59.5 percent of households headed by a single woman with children under 5 are poor. Cohen attacked me in the hearing, calling me "ignorant," and suggested that my telling the truth somehow showed disrespect to him. After the hearing, he approached me, put his finger in my face, and told me to come to his office and personally apologize to him. In 1997, Cohen opposed legislation that banned partial-birth abortion in Tennessee. This procedure was banned in federal law in 2003. Because of the unique brutality of partial-birth abortion, Associate Justice Anthony Kennedy included in his opinion, in which the Supreme Court upheld the constitutionality of banning this procedure, testimony of a nurse who witnessed it. She described the baby moving its fingers and toes as the doctor jammed scissors into the back of its head. Cohen's district in Tennessee is a picture of the kind of distressed communities that my organization CURE targets to help recover. It is two-thirds black, has eight ZIP codes with infant mortality rates triple the national average, has a median household income two-thirds the national average, and poverty 10 points higher than the national average. It is indeed a challenge to get truth into poor black communities that have suffered for years from liberal leaders like Cohen telling them what they need is more government and abortion. My work in Washington, D.C., focuses on getting public policy that will allow more flexibility for people like those in Cohen's district to self-govern. In 1996, a year before Cohen voted to oppose banning partial-birth abortion in Tennessee, I worked in Washington to pass welfare reform. The only apology I have to make is that I do not have more opportunities to testify against the distortions and damage caused by liberals like Cohen. He extols his affection for Planned Parenthood, which annually aborts more black babies than any organization in the country: "For me Planned Parenthood is part of my DNA. It is one of the finest organizations in this country." And he equates black fertility to slavery: "women since the days of slavery were ... encouraged to have children, because ... you needed ... more property to bring the crops to make the money." 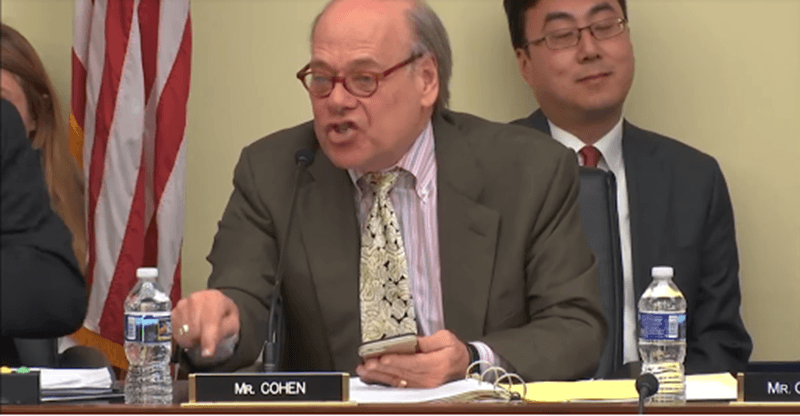 Work needs to continue to help poor blacks in Steve Cohen's district understand that he is the last person they should have representing them.